Throwing out the line first for Wednesday’s Secrets of the Pros is Lake Commandos featuring professional fisher, Nicole Jacobs, who travels across the U.S. as a co-angler on the Fishing League Worldwide circuit. 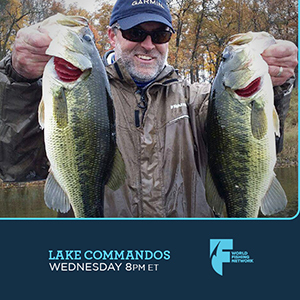 Show-host, Steve Pennaz is joined by Jacobs on a natural lake with largemouth bass and a remnant population of smallmouth bass. The goal – catch the most bass of either species. Then, Dave Csanda and Jeremy Smith on Lindner’s Fishing Edge employ advanced electronics to locate and catch huge channel catfish on the Red River between Minnesota and North Dakota. Next, Captain Dave Chouinard from Simms fishing company, jumps aboard the FlatsClass skiff with Captain C.A. Richardson for a day of catching reds and snook in backcountry. Lastly, Fishing University travels to Lake Jocassee in South Carolina with pro-anglers, Bill Siemantel and Troy Morrow, who utilize renowned SPRO fishing lures.